In recent years, the North American building industry has become a focal point for sustainability. Demonstrating leadership, initiatives like the LEED certification program and the BOMA Go Green program have been developed to recognize environmental sustainability for new and existing buildings. HOW DOES KRUGER PRODUCTS HELP CONTRIBUTE TO GREEN PURCHASING POLICIES AND BUILDING INITIATIVES? Kruger Products offers many options that can help an organization meet their environmental objectives. 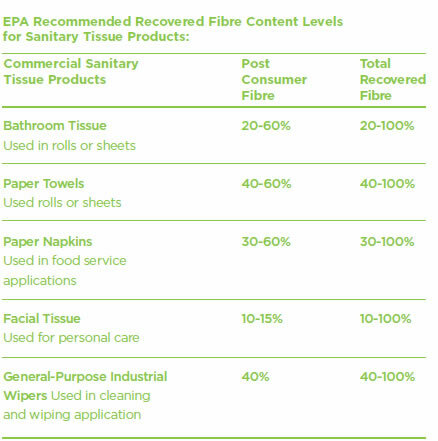 Many of our towels, tissues and napkins contain recycled fibre that exceed government requirements for recovered material and can contribute to certification in these programs. EPA (Environmental Protection Agency) forms a basis for many organizations’ environmental guidelines and policies. Leadership in Environmental Efficiency and Design (LEED) is a voluntary designation encouraging new and existing buildings to be environmentally sound and provides a structured process to measure success. This program was created by USGBC (US Green Building Council), which is at the forefront of environmental stewardship. Kruger Products L.P. is pleased to be a member of the United States Green Building Council. In the case of the LEED-EB (Existing Building) program, buildings earn a certified rating of silver, gold or platinum level. In the recent updates to the program, Ecologo certified products are specifically mentioned making it easier to identify products that can help attain LEED credits. Kruger’s tissue products contribute to certification.